Corboy & Demetrio is proud to announce its participation in the K9’s for Cops Public Art Campaign – Chicago, which was created by the Chicago Police Memorial Foundation to memorialize Chicago’s heroic fallen officers and support the families of police officers killed or catastrophically injured in the line of duty. The Chicago Police Memorial Foundation is partnering with PAWS Chicago, which will receive a portion of the proceeds. PAWS provides low-income residents with free spay/neuter services and medical care for their pets. The initiative pays tribute to the canines, which for many years have protected Chicago police officers and have assisted them in solving crimes. Approximately 70 canines currently help officers in Chicago every day. 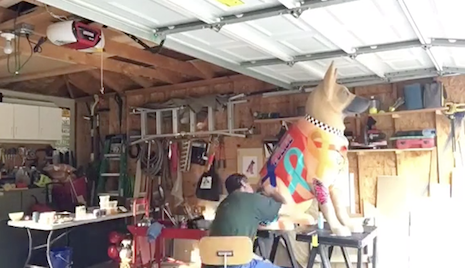 Chicago artist Juan Carlos Frias is working with Corboy & Demetrio to design and paint the 54-inch fiberglass German Sheppard. Corboy & Demetrio’s dog will pay tribute to survivors and victims of breast cancer, colon cancer, kidney cancer and ovarian cancer, with colorful awareness ribbons in a colorful design. Frias, who is known for his use of Monarch butterflies in his art, will also use them in the dog statue as symbols of hope for cancer survivors.